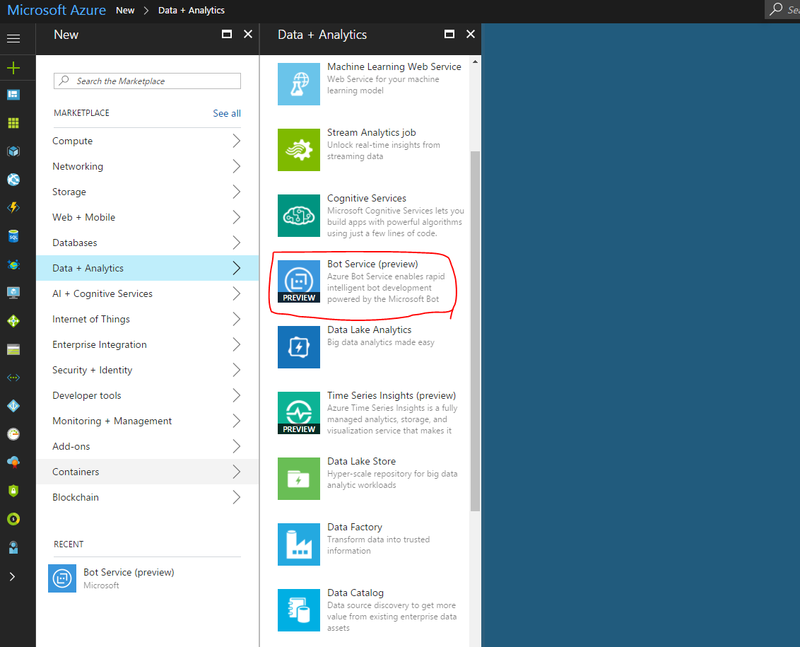 What is Azure Bot Service ? 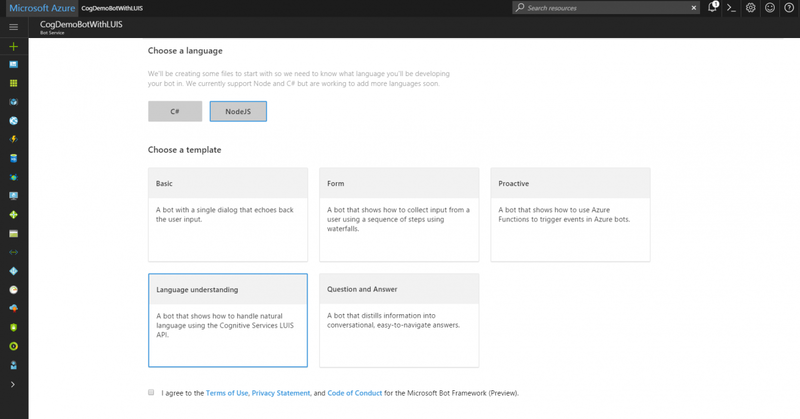 Azure Bot Service is a intelligent, serverless bot development service introduced by Microsoft Azure on Azure Portal. This service is used to develop conversational bots with the help of various templates, cognitive services by Microsoft. LUIS : LUIS is the Language Understanding Intelligent Service. LUIS enables developers to build smart applications that can understand human language and react accordingly to user requests. #2 – Create a BOT by filling the details like Bot Name, Subscription(default), Resource Group(Create New), and Location of your Choice. #3 – After clicking on create it will take some seconds to create your BOT. After the Bot is created, you have to create Microsoft App ID and password. Click on Create Microsoft App ID and password in above pic. Copy the App Id and Password and Go back to form and fill it there. #4 – In the same window, choose the preferred language for Coding, C# or Node JS. Choose the t appropriate template, we have chosen Language Understanding (using LUIS). Check on ‘I agree’ and proceed. Again it will take some seconds time to configure and build the BOT. #5 – After this it will ask you to connect your bot to LUIS. so click on sign in. #6 – This is how you console will look like after every thing is ready. #7 – Now go to LUIS portal , your app will automatically be listed under my apps. Click on your app to customize. This will open your LUIS app Dashboard with all analytics about your app and a side menu with attributes to customize the service. Before proceeding further it is necessary to understand building intents and entities for the Chat Bot, It is similar to what I explained in my previous post for AWS LEX. Intents: An intent represents actions the user wants to perform. It is a purpose or goal expressed in a user’s input, such as booking a flight, paying a bill, or finding a news article. How to Add intents? Utterances: An utterance is the textual input from the user, that your app needs to interpret. It may be a sentence, like “Book me a ticket to Delhi”. How to add Utterances? Entities: An entity represents an instance of a class of object that is relevant to a user’s intent. In the utterance “Book me a ticket to Paris”, “Paris” is an entity of type location. How to add Entities? #8 – Train & Publish the app from LUIS portal. 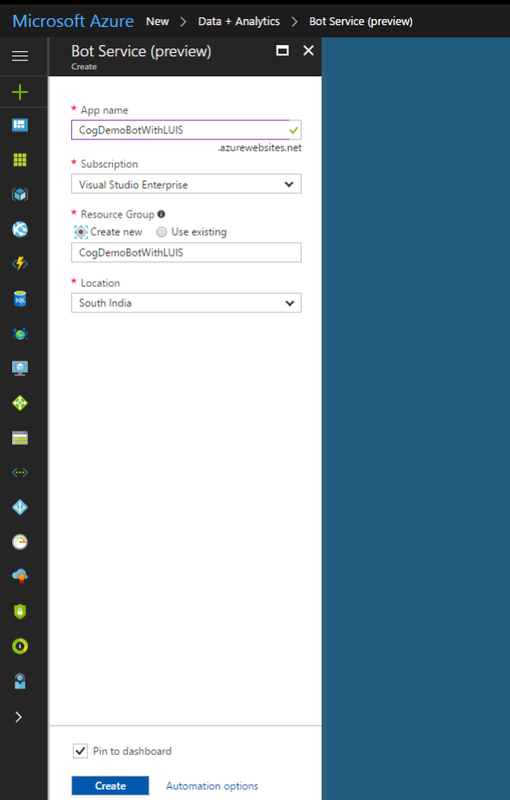 #9 – Now go back again to Azure Portal to access the LUIS HTTPS API in your BOT. Write the Node JS Code to access the JSON data returned by the LUIS API and providing appropriate response to users queries (Utterances) . Here it is, Your BOT is ready! Previous Post The road to achieve Greatness!